Star Trac Fitness were one of the manufacturers which stole the show at this year's Leisure Industry Week in Birmingham, where dozens of sport and fitness suppliers came together to unleash their newest and most advanced products on the UK industry. As well as the Spinner® Blade ION, Star Trac Fitness were behind two other exciting new releases about which there was a lot of excitement. These were the Star Trac ET-C Treadclimber which are an innovative machine which utilises the best features of a treadmill, elliptical and stepper and the new Star Trac Boxmaster. This new category of cardio equipment brings the workout intensity associated with running on a treadmill together with the low impact of an elliptical and the extended knee and hip flexion of a stepper. The patented design and movement pattern maximizes caloric burn and motivates users to work harder, burning up to twice as many calories as traditional cardio equipment. 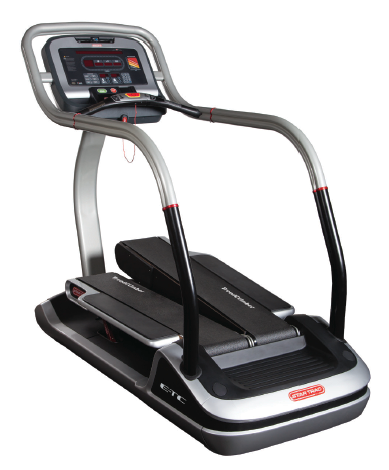 Dual user defined ramping decks provide an incline to flat step pattern capturing all the benefits of a Treadmill, Elliptical and Stepper. Having tested out the Treadclimber ET-C here at the Origin Fitness showroom, we can testify that this piece of kit provides a totally unique cardio workout. This entry was posted in Just Launched and tagged treadclimber, star trac on 15th October, 2013 by Colin Evans.